A crimson light reflects on the ice and snow. The colours of the mountains, the water, the sky, the sun: Emanuel Aage Petersen (1894-1948) painted the overwhelming scenery of Greenlandic nature. As a painter he places himself within that kind of art that comes from the outside, but glances in. Nuuk Art Museum has a large collection of works by men called “Greenland Painters”. The definition of “Greenland Painter” emerges as a particular genre around the mid-19th century. At that time, a few Danish artists travelled to Greenland and used its landscape and people as motifs in their paintings, achieving some renown for that. As a genre, this practice combined the artistic with the documentary: it was concurrently an artistic enterprise and also shared the growing curiosity in Europe towards this remote land far in the North and its people. This genre of painting played an important role in creating an image of Greenland for the European public before photography became established. 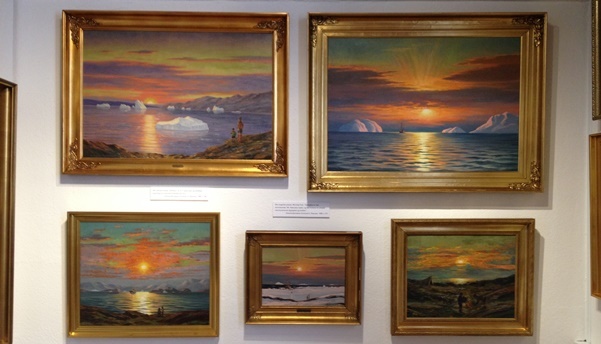 Being for the last time in Greenland in 1946, Emanuel A. Petersen was the last so-called “Grønlandsmaler”; he painted the Greenlandic nature over and over again in a romantic style in a time when photography had already taken over from drawing and painting as the chief documentary medium. Jette Bang, a Danish photographer now known for her black and white photographs of Greenlandic people, travelled to Greenland for the first time in 1936, and recorded the colour film Inuit in 1938-39. Educated as a scenic painter, Petersen travelled to Greenland several times from the 1920s and up until the 1940s. His goal was to travel and paint all the way around the coastline of Greenland – and he almost did. He wanted to show the original indigenous Greenland and eventually collect his paintings in a book along with texts. He never finished the book, but some years ago the work was published with the writings he left and illustrated with some of his paintings. In his short life, Petersen created between 2000-3000 paintings, many of them on commission. These works were made in numerous copies, both identical or as variations on determined subjects, e.g. sunset and sunrise, a dog sledge crossing a mountainous landscape, or the woman with a topknot. Many of the paintings in Nuuk Kunstmuseum’s collection are variations of each other too and feature such recurring elements, for this reason it is difficult to point to one specific key piece among the others. Even though Petersen depicted different places in Greenland, his images are not necessarily precise representations of the places, nor are they historically correct. They rather aim at a beautification, at a certain perception of harmony; thus in some paintings proportions have been adjusted, in others mountains have been moved a bit. Emanuel A. Petersen did not only paint nature, he also portrayed the people’s homes, like turf houses and settlements. On a closer look, though, such dwellings – just like the people placed in them – are not central in the images, they are more properly “extras”. The people in the paintings are not portraits either, rather sorts of archetypes – that is, a certain idea of the Greenlanders that Petersen references again and again. For instance, the woman in the traditional Greenlandic outfit and with the topknot is placed in numerous paintings, sitting or standing, and often looking out at sea. However, Nuuk Kunstmuseum also owns some sketches by Petersen where he actually drew people with individual features, more like proper portraits. The fact that people turns rather into an archetype than a portrait may have to do with what the artist was first and foremost interested in: it was the nature he really wanted to paint – the beautiful and overwhelming, with its colours and its light. Thus, the human being is really just an eye catcher, a way of creating focal points and balance in the picture’s composition – not the essential, but a direction or a trace in the painting. Emanuel A. Petersen paints nature, people and dwellings from a distance; he does not share in the life of the scene – he records and reproduces. However, the distance, which would otherwise seem to stand for an impartial recording, is not necessarily the same as objectivity towards the subject of representation: in fact, Petersen’s paintings are not historically accurate documents. Since “expedition art” (as is the case for these paintings) contributed to the mapping of Greenland, Petersen also enters colonial history. The artist conquers the land with his gaze – he documents and converts natural scenery into a landscape. In an article called “On Other Pictures; Imperialism, Historical Amnesia and Mimesis”, curator and scholar Candice Hopkins (b.1977) writes of landscape painting as territorial expansion and as a way of conquering land. Landscape painting was the first art genre to form a school in the independent conquered North America in the mid 19th century – a way to appropriate the country. It is precisely this particular degree of the beautiful that lurks in Emanuel A. Petersen’s paintings: the sublime. However, whereas nature in Romantic art presents an element of danger and the feeling of engulfing the viewer, Emanuel A. Petersen’s paintings seem more consistent with the period of Danish art history defined as Golden Age (Guldalderen). Such period – spanning over the first half of 19th century – saw artists staging the Danish nature under the inspiration of European Romanticism: not the wild and overwhelming, but the harmonious and cultivated. The emphasis in Emanuel A. Petersen’s paintings is not on the dangerous and engulfing in nature; such paintings are more like postcards, where the beautiful and breathtaking – albeit alien – nature is seen from a distance. Apart from his Golden Age paintings, Emanuel A. Petersen also drew sketches amidst nature, which were later developed into larger paintings in studio. Most often drawings would be sketched in Greenland and the paintings executed once back in Denmark, which may have added further distance to the scenes observed. The final artwork was thus not created on the spot, but far away from its proper origin, based on sketches and memory. It is the gaze and the distance to what is seen that essentially characterize Emanuel A. Petersen’s paintings. He did not paint the known or the familiar, rather he mapped a new territory. He painted in a period when anthropology was burgeoning in Europe, discovering the last remote cultures and territories yet unknown – “others” invariably scrutinized by a Western gaze. Greenland is such an “other”. Emanuel A. Petersen is in his own way part of this historical moment. The recording of a region and culture, along with the collection of objects, became the way of anthropologists to preserve the last indigenous cultures still untouched by Western civilization. The view on the “other” is often that of something different from – even opposite to – the civilized western individual: sometimes with the negative connotation of uncivilized and barbarian, other times with the devotion for something lost, such as the connection felt lost by Westerners with some bygone original dimension; still other times it was seen as a curiosity. Though Greenland was far from untouched at this time, Petersen is still searching a certain image of it. In his draft for the book Greenland in pictures (Grønland I billeder) – the uncompleted work published posthumously by Ole Lykke and Poul Madsen – Greenlanders nonetheless appear as his equals: they are good companions who would follow him on his long journeys, be it for painting or exploration, by boat or dog sledge. They’re not an exotic other, a curiosity or idolized people of nature. They are mostly just fellow travellers, though sometimes with different habits. In his texts, nature is completely different than in the paintings: it is actually dangerous. There is he embarking on long and perilous sledge trips across Greenland’s wild nature, on unstable sea ice, over unseen hills and screaming storms. He sailed along the whole coast on a motorboat, with storms directing ominous breakers onto his boat and icebergs capsizing all around. Yet, in Petersen’s paintings the land and its nature are recorded and conquered by the artist’s gaze, and turn thereby into something beautiful and harmonious. Petersen’s view was not one from the inside out, but from the outside and in. His gaze was mostly concerned with a certain pictorial and natural beauty, a beauty of the colours and of light. All the while, it also stands for the view of his time, when countries and cultures were being mapped and subjugated by the western individual.